2014 Grand Fondue. October 12th! Wine. Back roads. Food truck with tasty morsels. Epic vistas. The 2014 Grand Fondue at the Orchid Cellar is coming and this year we have great things planned. Better food. More drink options. All new routes. More music. This year we’ll have 3 routes. The 26 miler is the shortest, and takes in classic dirt roads in the Middletown Valley, winding past working farms, shaded streams and rolling country vistas. The 50 miler is a challenging but approachable ride, with 5k of climbing, mostly at the start of the ride. It features some tough ascents and some wicked fast descents, including one of the hardest climbs in the county. The 100 miler is a great ride this year, with the option of bailing at 50 miles. 10k of climbing, great dirt roads, epic climbs and brake pad burning descents. As usual we’ll have a really cheap entry fee. A no-profit venture. Races are pricey. 100-150 bucks for a day of riding. What about a big ride that costs riders 30 bucks, gets them some wine and food and a commemorative wine glass? That’s what we’re talking about! Email us to sign up. Bikedrfrederick(at)gmail(dot)com Put grand fondue in the subject, and let us know which length ride you’d like to do. We’ll send you a paypal button so you can pay online, or stop in the stop, and we can do credit or cash. Our Grand Fondue is about eating and riding. Ride a huge ride, come back to a scenic winery in Middletown for some awesome food and wash it all back with some Merlot and Mead and chocolate fondue. Andre and Dan the Younger, who used to work at our shop, craft and market Orchid Cellar wines and meads. The Orchid Cellar will be hosting the after party, where riders can grab some food, sample some wine, and enjoy a beautiful valley overlook. We’ll also have a few fire pits going! Nothing will be timed, there will be no winners. It’s going to be a challenging but relaxed ride, an easy pace to ease the legs through the terrain. We’ll take in some of the finest and smallest roads in Frederick County. Even the 26 mile ride is going to be challenging, even with 1/4 of the miles and 1/4 of the elevation. Don’t worry though, even the shortest ride has some fantastic scenery and barely travelled roads. -The 50 mile folks and the 100 mile folks will share the first 50 miles. Usually, everyone sorta splits up, but hopefully this will keep more folks together for longer. -Food Trucks. We’ll have a few great food trucks out there whipping out some amazing food. Your Fondue ticket will have a voucher in it for meals from said trucks. Of course this means you won’t have to bring a sack of beans or a dram of hot sauce. -More music. The first year we had none. Last year we had one band. This year we’ll have a band and our man AJ spinning some tunes and maybe another band too. Post ride party time! -Local vendors showing off cool stuff. We’re lining up some rad local businesses that you might not know about to come show off some stuff. -Orchid Cellar is whipping up some new wines and mead variations as part of your ticket, and will have affordable refill pours if ya wanna sample some other stuff as well. 100 mile and 50 mile rides start from the Orchid Cellar at 7am, so get there earlier to sign a waver and give us money, if you didn’t in advance. At the latest, get there at 6.30. You think you won’t need headlight, but the last riders last time got in well after dark. The shorter rides will leave from the Orchid Cellar at 2pm. Again, get there earlier. There will be a mechanic on hand if you have minor issues with your bike. He won’t have cables, housing, chains, tires or cassettes. We are talking basic stuff: tighten this, loosen that. This is a cheap event, and we wanna keep it that way. If you have doubts as to whether your bike can handle the ride, get it into the shop at least a week prior to the event. How Much: The entry fee is really reasonable. The support on the ride therefor is minimal. We’ll go into what to bring in a minute here but first the cos. Still cheap. 30 bucks. What does my 30 bucks get me? Two glasses of either Merlot or Mead, a commemorative glass with something about the Fondue on it, two food truck vouchers, and a super minimal sag wagon with some minimal support stations. There will be local music out there, as well. There will be a few sag wagons, but KNOW YOUR LIMITS. If 10,000 feet of climbing sounds like a lot, it is. This ride makes the Civil War century seem civil… The riding will be hard, even if the pace is not. There will be gravel and dirt roads. Challenges galore. Please sign up for the appropriate ride for your abilities. Remember, even the short ride will be rad! We’ll have a mechanic who is roving around, but he will be minimally equipped. The 50 miler and the 100 are both hard this year. Rough, too. Come prepared. What to bring: This part is going to sound preachy, but it contains the important nuggets, so bear with me. A bike with low enough gears to get you through a big HILLY ride. Water. Lots of food, including something to get you through if you start to bonk. That means Gu or some other sort of energy Gel. Appropriate clothing. We’ll be huffing up huge hills and coming down them pretty fast. Sweat+steep roads=wind chill. We won’t have spare clothing, so figure out what works and bring it. There will be very few places to stop for additional food. There will be only a few designated rest stops, and they will have minimal provisions: extra water, Gatorade, basic snacks. This is not a supported century ride. This is a big self supported ride in the country with like minded folks. Please bring a blinkie light, if it is overcast, starts to rain, or you just get caught out in the dark, we want you to be safe. Spare tubes (2 per person), a patch kit and a enough C02 or a hand pump to fix at least 2 flats. We will be on some dirt roads, so please bring a bike you will be comfortable riding on such surfaces. If it is a road bike, get some durable 25mm tires or 28′s if they fit. Ask in the shop if you are unclear on any of this. How to sign up: Stop by the shop or email us. Soon we’ll have a paypal button, but currently we’re accepting Credit cards or cash. We can do credit over the phone, too. No checks, please. If you want to email us, we’ll have you split your CC into a few emails. It’ll be easy, and we can walk you through it. 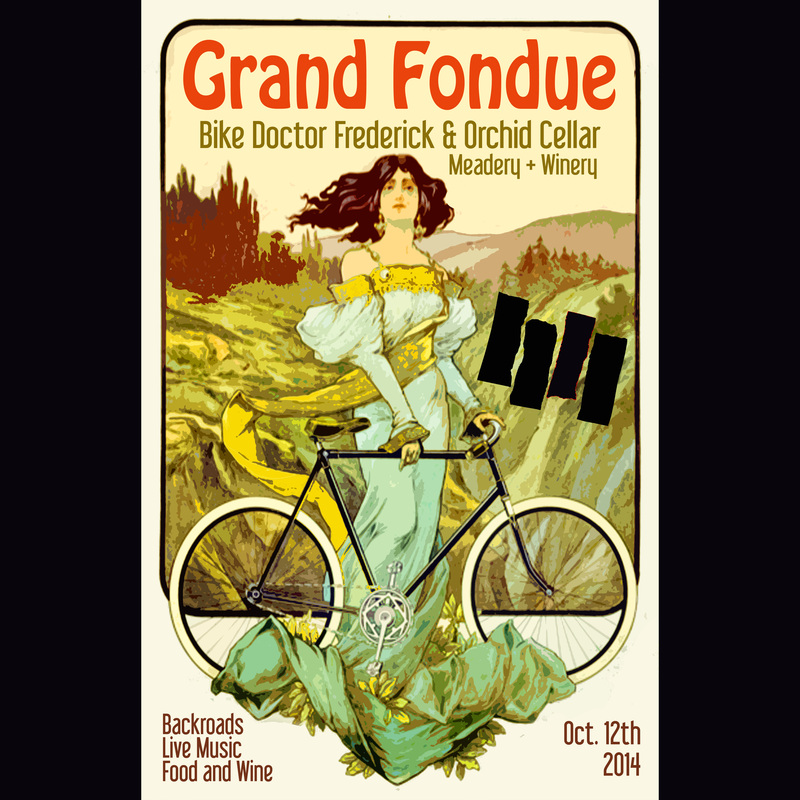 bikedrfrederick@gmail.com Put Grand Fondue in the subject.